Dr. M.Saraswathi is a well-known practitioner and social worker of chennai city. She had written many books in the regional language Tamil. She had presented scientific papers in seminars and also written articles on gynaecological problems. She had been awarded by many public organizations. A lady aged 45 consulted me with history of heavy bleeding with severe clots, had once in once in 15 days and long lasting for 8 days. She also suffered with severe back pain radiating to left leg. Initially treated with hormone replacement therapy and even dilatation and curettage also done. 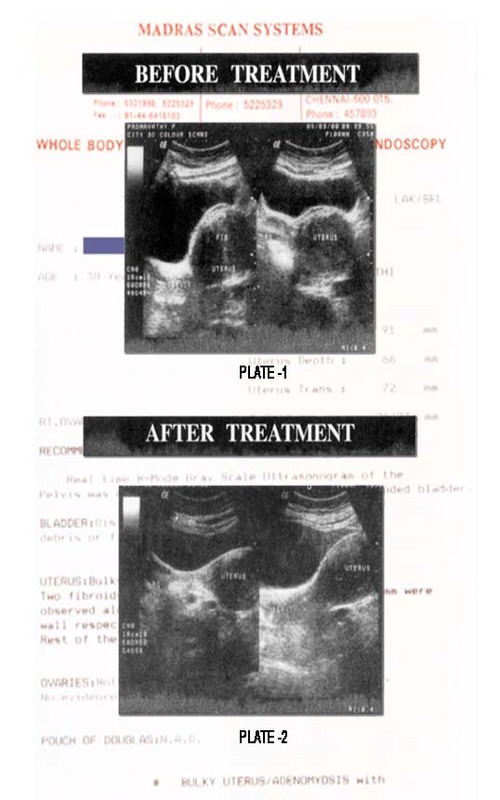 Surgery was advised to find solution to her problems, came to homoeopathic treatment to save her uterus. She is a bulky woman, fair, fatty and sluggish. Though she was very badly constipated, she was not disturbed by it. She has three children who were born under normal delivery, had three abortions. Sterilization was done twenty years back. flow once in 15 days. flow < by getting up and changing position. thinking of the ailment always. insomnia (she was under sleeping pills). Calc Flour 6x b.i.d for fifteen days. I prescribed the same medicine once in fifteen days and finally the scan report showed excellent result, which was taken on 29-10-2000. Uterus : Bulky but no uterine fibroids. Ovaries : both ovaries size and eco - texture normal. Her treatment was stopped. But still she is taking treatment for her acute complaints like cold, diarrhoea and headache without any recurrence of her old ailment.